Before we get into the benefits of upgrading your platform, let’s first discuss what this means. A website platform includes an operating system, a web server, a database server and a host of tools and libraries that support the language the website is written in. Here at Jola Interactive, we’re mostly focused on developing Magento websites, and when appropriate, WordPress websites, as well as specializing in virtual photography for the last couple of years. All of these technologies mentioned run on LAMP stack, which is an acronym for the four components that make it up: Linux, Apache, MySQL and PHP. This being said, MariaDB is quickly becoming a lead database option over MySQL. Now that we have a better understanding of what specifically you would be upgrading within your platform, let’s take a closer look at the components that make up the LAMP stack and the affects that upgrading has on them. As far as operating system go, most Linux options today are updated on a regular basis and you should make sure your system administrator implements these updates. Chances are you’ll find a CentoOS or Ubuntu server on most websites and updating them is quite easy, everything can be done with a couple of terminal commands. We have run some parallel tests between websites that were built with MySQL versions 5.1 to 5.7 and have found that there was not much difference in terms of how the site functioned speed wise, but upgrading your database can still provide your site with bug and security fixes that can overall help the health of your site. Apache is an integral part of the web and is fairly consistwnt with it’s releases (updates) for the last two decades. Similar to databases, our development team did not see a considerable difference in how any updates to this affected the speed of a site. It’s been now almost two years since the release of PHP 7 and we’ve had some really good experiences with it. The major improvement is, of course, performance. 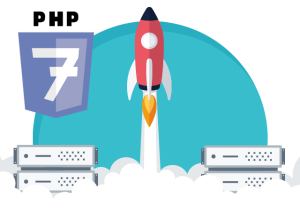 PHP 7 is incredibly fast compared to previous versions and the overall feeling is that pages load much faster for our clients and their customers. Not only is there a difference for our clients and their consumers, but from a site development standpoint, we have found that PHP 7 has helped with the previously long load times when working with Magento by turning off cache and css/js merging. With thanks to the good people at Inchoo and their Inchoo_PHP7 extension (which solves a few Magento to PHP7 backward compatibilities), we’ve already upgraded a dozen of our client sites (utilizing Magento 1.9 CE). These upgrades went smoothly and the responses from our clients were very positive. These four components: Operating System, Database, Apache, and PHP are the four supports that keep your site up and running. As you can see from the research, testing, and comparisons that we’ve made, keeping these components up to date and healthy will not only mean that your site will be secure and bug free, but also means that you’ll have happier customers and better sales with minimum effort.